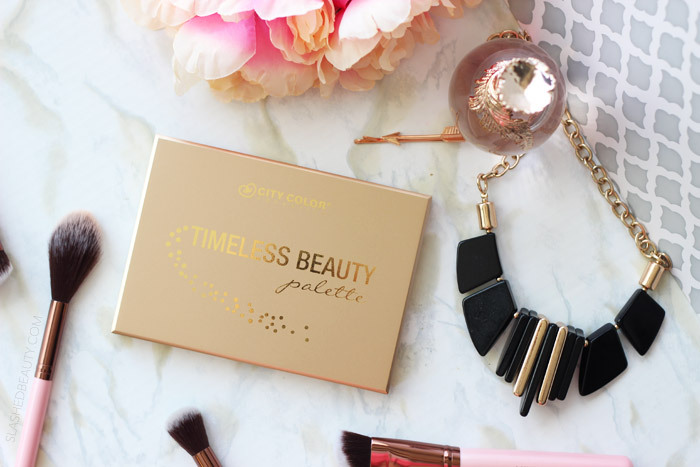 Today, City Color Cosmetics released their much-anticipated Timeless Beauty palette— the bigger and more versatile sequel to the Timeless Beauty Quad. I picked mine up in advance at Gen Beauty last month, and let me just say: you’re gonna want to grab it ASAP before it sells out today… because it will, no doubt. 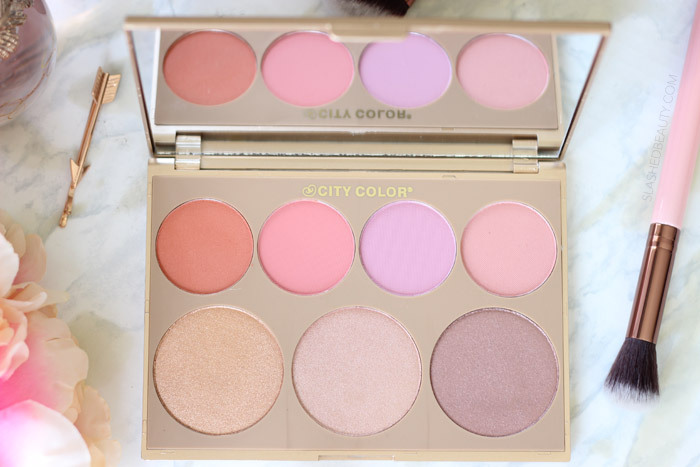 The City Color Timeless Beauty palette houses four blushes and three large highlighters in a medium-sized golden palette. Inside, you’ll also find a full mirror, which I love because I can see my whole face when doing my makeup to see my entire look coming together. The palette itself is incredibly sturdy with a snap closure, and I will totally be packing it with me on my upcoming vacations coming up! What impressed me most about this palette was the shade range. It seemed like there really is something for everyone inside, across multiple skin tones. The blushes come in a warm apricot, a rosy pink, a medium lavender, and a pale pink. 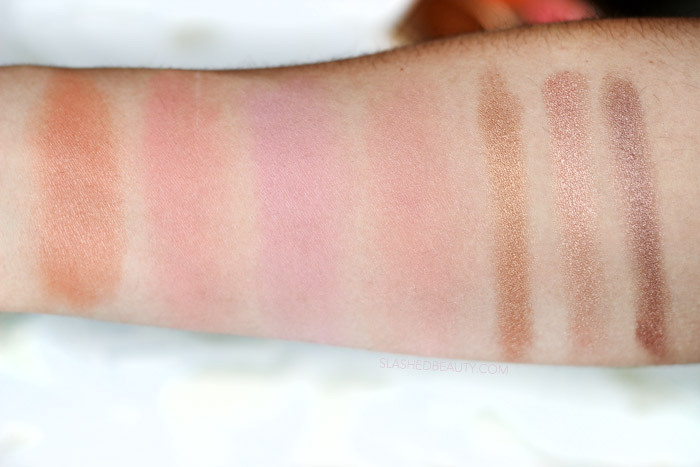 All of the blush shades are matte except the pale pink, which has very fine, subtle shimmer. The formula is very soft and smooth, although can get powdery. The highlighters come in three gorgeous shades: a golden champagne, a metallic light pink, and a beautiful glowy taupe (which would look AMAZING on darker skin tones). While most of the shimmer is a spray-over, they still retain their sheen once you get past the first few layers. The formula is velvety and so easy to work with. What’s more important about the shade selection is the shade performance, and the Timeless Beauty palette didn’t disappoint. I was genuinely surprised with the pigmentation of each and every shade. The blushes needed hardly a tap of a brush to get a ton of color transferred onto the face, and the highlights made a strong statement as well. While pigmented, the shades are all very blendable and so can be sheered out if you want a lighter look. On top of the great pigmentation and shade range, they actually last. I’ve always had really good luck with blushes from City Color, and these are no exception— the color actually did last over five hours over my NYX HD foundation. That’s a win! For once, I honestly have no complaints about this palette. I think it’ll work well for so many people, and even though at $24.99 it’s priced a bit higher than the brand’s other products, the quality, quantity and variety justifies the price. Plus, you can get an extra 10% off by clicking through my link to the City Color website. Today is the first day the Timeless Beauty palette is available online, and I am making a bold prediction it may sell out. Get it before it’s gone, it’s so worth it! 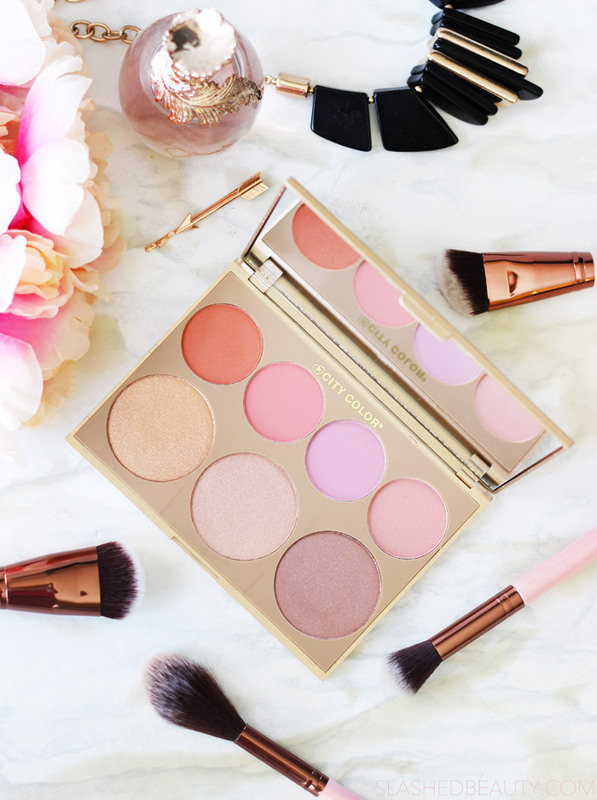 Which is your favorite blush and highlight shade from this palette? Nice brushes !!! Really pretty, what brand ??? I got this palette recently and love it so much! I heard a rumor that the blushes in the palette are the same formula as the Be Matte blushes, which are some of my all-time favorites. I found that two of the highlighters in this palette are too dark for my fair skin, but they make great blush toppers or eyeshadows for me as well. This palette looks so high end! I do love my City Color! Beautiful photos first and foremost. I need to try this brand! Those highlighters are so pretty and pigmented! I think they look pigmented enough to be used as eyeshadows as well! Very pretty! This brand has so many good products. What a pretty kit. Thanks for the great swatches. The blushes are very pretty. I would probably use the browns as shadows. These shades really are timeless! These are the types of shades I reach for daily. 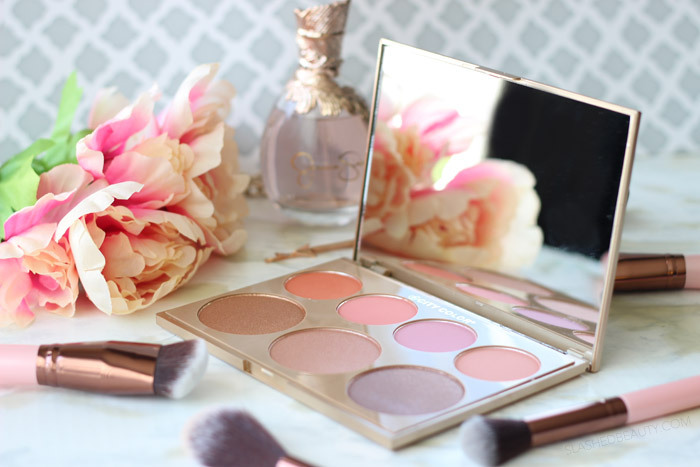 Oh, this is pretty.. and that taupe looks like it would be a nice eyeshadow on me! BTW, I’m so missing the buttons on the bottom that tell me what post is newer or older.. I wish I could get those for my blog. I really like them! I’m totally obsessed! I just love how the shades are actually rather different from each other, so I can get a lot of different looks from it! And you’re right– the pans are pretty big too, so the price isn’t too far off. I’ve always been impressed with City Color cosmetics. In fact, one of my most-used blushes is their Watermelon. I haven’t tried that one! I always used their Be Matte blushes and loved them.